Sergeant 'Buster' Kilrain: I'm Kilrain, and I damn all gentlemen. Q: What is the significance of the ending? Q: What happened to General Kemper? Q: What is the background of the seminary building used during the battle? All I hear is people griping about how long this film is. That's not the point. The point is it represents what is considered by historians to be the most important battle of the American Civil War. I will admit that the length of the film kinda takes away from it, but it is nonetheless good. Save a few historical gaffes (eg. Chamberlain and the 20th Maine at Picket's Charge - in reality, they were being held in reserve near the Round Tops with the rest of the V Corps), this film is very realistic, using thousands of professional re-enactors to fight the battle scenes, which adds to it. Many battles and side notes were left out (eg. 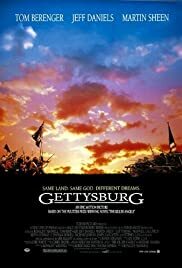 Vincent was mortally wounded on Little Round Top; or did they mention this, I don't remember), but that is okay, given the film focuses on Joshua L. Chamberlain and the 20th Maine, who saved the day at Little Round Top on July 2. Skirmishes at the Herr Tavern, McPherson's Hill, Little Round Top, and Picket's Charge were all the fighting I remember. But, again, this doesn't really take anything away. The sweep and grandeur is helped by the superb cinematography (by Kees Van Oostrum) and great acting on the part of Tom Berenger (Longstreet), Martin Sheen (Lee), Jeff Daniels (Chamberlain), C. Thomas Howell (Tom Chamberlain), Sam Elliot (Buford), and the rest of the superb cast. A standout is the late Richard Jordan as Lewis Armistead, the brigade commander in Picket's division who was killed leading his troops "over the top" against Union artillery. 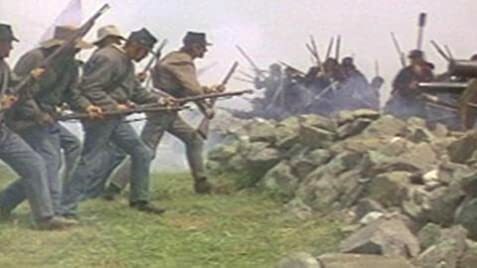 The battle scenes are excellent; Picket's Charge, in real time, is superb, but the furious battle for Little Round Top is one of the most desperate battle scenes ever filmed. You can feel the fear and tension of the 20th Maine as the 44th Alabama (I believe this is correct) charges up the hill again and again. When Chamberlain and his men finally sweep their opponents off the hill? I think that it may have been good to portray the charging Confederates as well, since they had many interesting stories among them (e.g., the commander of the 44th, William Oates, had a brother, John, who had been ill with a fever and refused to stay behind, and was mortally wounded in the carnage), and the heroics of such people as Vincent himself, and Patrick O'Rourke (who led his New York regiment in a counterattack that saved Vincent's right flank and was killed in the charge) are neglected, but I'm not complaining. Despite the length and a few overdramatic speeches, this is a great movie.